Most of the major spring events take place at local winter resorts, including a variety of snowboard competitions that make for great spectator viewing. At Lake Louise a half pipe and jump are constructed right in front of the day lodge for this specific purpose. One long-running spring event is the Slush Cup, which takes place at Sunshine Village (www.skibanff.com) in late May. Events include kamikaze skiers and boarders who attempt to skim across an almost-frozen pit of water. While winter enthusiasts are at higher elevations, swooshing down the slopes of some of North America’s latest-closing resorts, early May sees the Banff Springs Golf Course open for the season. 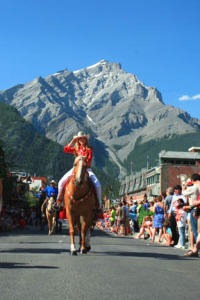 During the second week of June, the Banff World Media Festival (403/678-1216, www.banfftvfest.com) attracts the world’s best television directors, producers, writers, and even actors for meetings, workshops, and awards, with many select screenings open to the public. For many delegates, pitching their ideas is what draws them to this event. The main venue is the Fairmont Banff Springs. Summer is a time of hiking and camping, so festivals are few and far between. The main event is the Banff Summer Arts Festival (403/762-6301 or 800/413-8368, www.banffcentre.ca), a three-week (mid-July to early Aug.) extravaganza presented by professional artists studying at the Banff Centre. They perform dance, drama, opera, and jazz for the public at locations around town. Look for details in the Crag and Canyon. 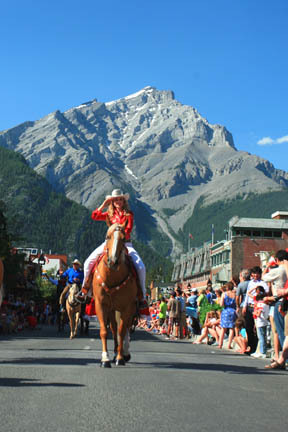 On July 1, Banff kicks off Canada Day with a downtown pancake breakfast. Then there’s a full day of fun and frivolity in both Central and Banff Avenue Parks that includes events such as a stupid pet tricks competition. An impressive parade begins at 5 p.m., followed by a concert in Central Park and fireworks. Each summer the national park staff presents an extensive Park Interpretive Program at locations in town and throughout the park, including downstairs in the visitors center at 8:30 p.m. daily. All programs are free and include guided hikes, nature tours, slide shows, campfire talks, and lectures. For details, drop by the Banff Visitor Centre (403/762-1550), or look for postings on campground bulletin boards. Fall is the park’s quietest season, but it’s busiest in terms of festivals and events. First of the fall events, on the last Saturday in September, Melissa’s Road Race (www.melissasroadrace.ca) attracts more than 2,000 runners (the race sells out months in advance) in 10- and 22-kilometer (6- and 14-mile) races. One of the year’s biggest events is the Banff Mountain Film Festival, held on the first weekend of November. Mountain-adventure filmmakers from around the world submit films to be judged by a select committee. Films are then shown throughout the weekend to an enthusiastic crowd of thousands. Exhibits and seminars are also presented, and top climbers and mountaineers from around the world are invited as guest speakers. Tickets to the Banff Mountain Film Festival go on sale one year in advance and sell out quickly. Tickets for daytime shows start at $45 (for up to 10 films). Night shows are from $38, and all-weekend passes cost around $180 (weekend passes with two nights’ accommodations and breakfasts start at a reasonable $350). Films are shown in the two theaters of the Banff Centre. For more information, contact the festival office (403/762-6675); for tickets, contact the Banff Centre box office (403/762-6301 or 800/413-8368, www.banffcentre.ca). If you miss the actual festival, it hits the road on the Best of the Festival World Tour. Look for it in your town, or check out www.banffcentre.ca for venues and dates. Starting in the days leading up to the film festival, then running in conjunction with it, is the Banff Mountain Book Festival, which showcases publishers, writers, and photographers whose work revolves around the world’s great mountain ranges. Tickets can be bought to individual events ($16 to 30), or there’s a Book Festival Pass ($130) and a pass combining both festivals ($280). By mid-December lifts at all local winter resorts are open. Santa Claus usually makes an appearance on the Banff Avenue skating rink at noon on the last Saturday in November; if you miss him there, he usually goes skiing at each of the local resorts on Christmas Day. Events at the resorts continue throughout the long winter season, among them World Cup Downhill skiing at Lake Louise in late November. 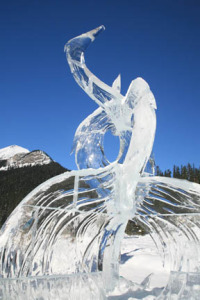 Snow Days is a month-long celebration starting mid-January that features ice sculpting on the frozen lake in front of the Chateau Lake Louise, the Lake Louise Loppet, live theater, a photography competition, and a spelling bee.